Kunal hails from Agartala (India) and received his Bachelor of Technology degree in Chemical Engineering in 2015 from SRM University, Chennai. 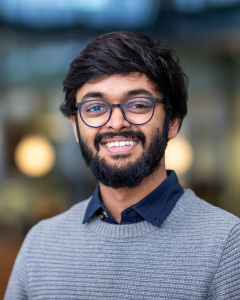 He moved to The Netherlands for his MSc education in the Sustainable Energy Technology program at TU Eindhoven during which he undertook an internship in the M2N research group and a graduation project at Solliance Solar Research. He worked with perovskite materials during those projects, focussing on vapour-deposition techniques and novel device architectures for photovoltaic applications. He later joined the group as a PhD candidate under the mentorship of Prof. Rene Janssen to contribute to a project aimed at developing tandem solar cells. His research would seek to complement the spectral absorption features of silicon-based devices using thin perovskite films to overcome thermalization losses and thereby improve performance. The collaborative assignment also lays emphasis on the scalability of fabrication and the stability of devices.